Need a quick and healthy weeknight dinner recipe? 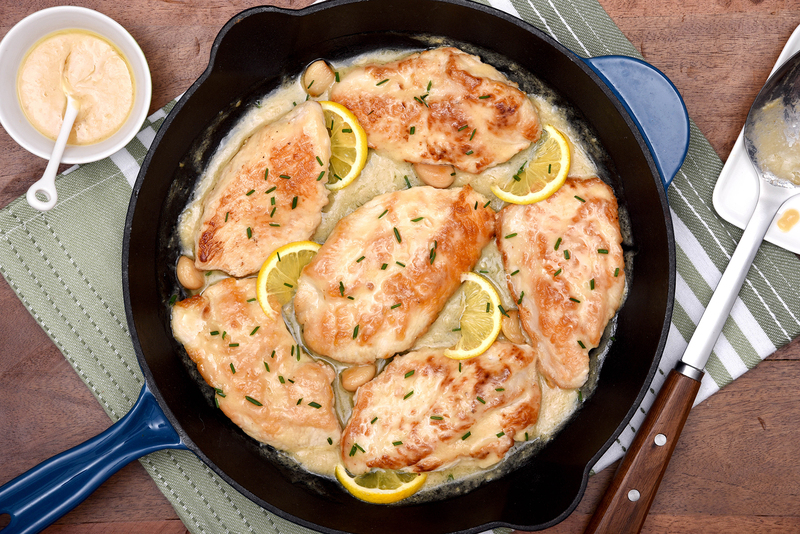 This Creamy Lemon Garlic Skillet Turkey recipe is packed with flavour and so easy to make! How often do you reach for turkey when grocery shopping? I never realized how my brain was wired to thinking that turkey was a “holiday” meat for so long. There are unlimited ways to incorporate turkey into your everyday meals. And with so many good reasons to enjoy turkey, you need to put it on the top of your weekly grocery lists. Keep reading for the recipe and an awesome giveaway too! October is Canadian Turkey Month and I’m so excited to get Canadians cooking with turkey all month long! Whether you’re planning for weeknight dinners, weekend family nights, or gatherings with special friends, Canadian turkey can be the cornerstone of every meal. Try swapping turkey for the usual protein in any of your favourite recipes and get ready to be surprised at how delicious and tasty it will be. This recipe for Creamy Lemon Garlic Skillet Turkey is a perfect serving of pure comfort food, packed with flavour and satisfying protein. There are so many ways to get cooking with turkey and Canadian Turkey Month is a great time to treat your family to some new and exciting turkey recipes! Consider reaching for turkey as part of your weekly grocery routine. Hectic days and packed schedules make it challenging to prepare healthy recipes, and by choosing turkey, you can feel good feeding your family meals packed with protein and nutrients. For breakfast, lunch, dinner and snacks, make the switch to turkey as part of your everyday meal planning. Canadian Turkey has endless tips and recipes that can help you choose dishes that will make it fast and easy for you to feed your family every day. Planning for Thanksgiving? Canadians are gearing up to celebrate one of their favourite holidays of the year! Making memories over a festive meal with family and friends is the greatest way to participate in this Canadian tradition. Whether you’re a novice cook new to feeding a crowd or a seasoned pro in the kitchen, let Canadian Turkey help you create a show-stopping Thanksgiving celebration with a delicious and memorable meal. 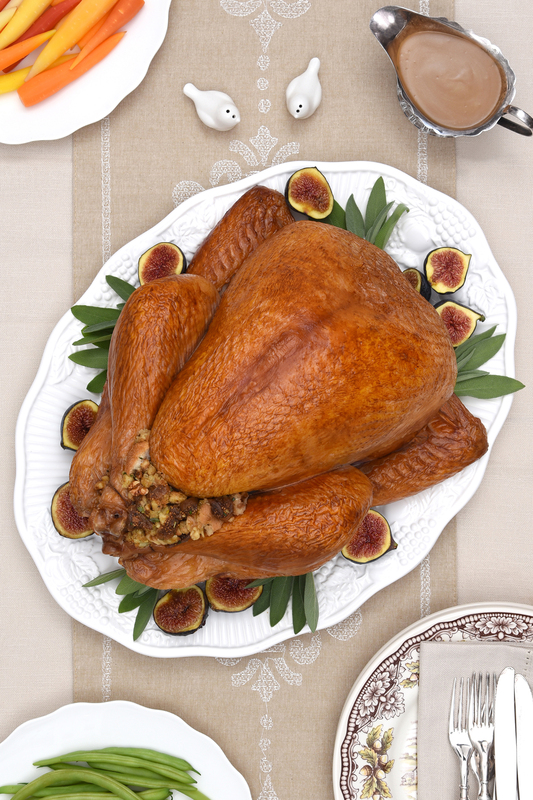 Like this Thanksgiving Turkey with Fig and Walnut Dressing recipe! Maybe you are planning a smaller meal and looking for inspiration? 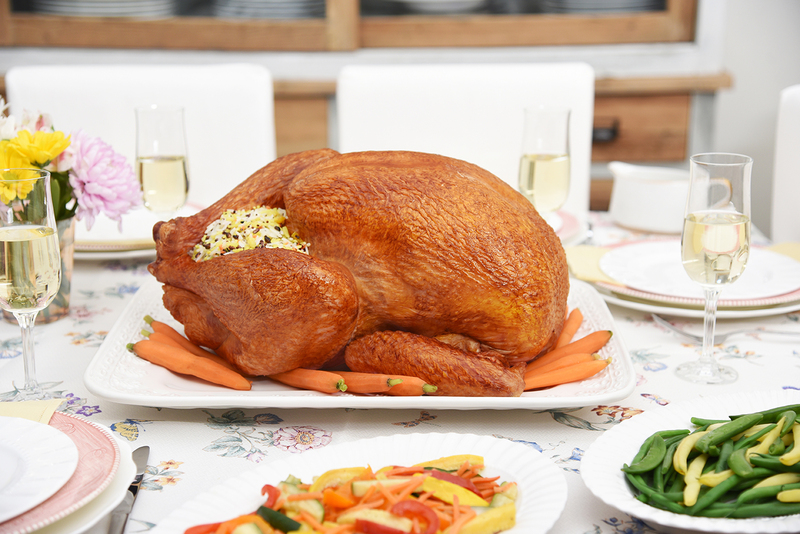 For a family of 4 or 6, roasting a half turkey can be a great way to celebrate! A half turkey cooks up just as delicious and festive as a whole turkey. For single parents, empty nesters, or romantic couples looking for that traditional inspiration, Canadian Turkey has compiled a large library of delicious options. A turkey breast can be butterflied, rolled and roasted, and served with stuffing on the side to make a gorgeous feast on a smaller scale. Your local butcher or grocer is an invaluable resource and can help you find a solution that works for you. October is the official month of Canadian Turkey, after all, Thanksgiving for us Canadians is on October 8th! 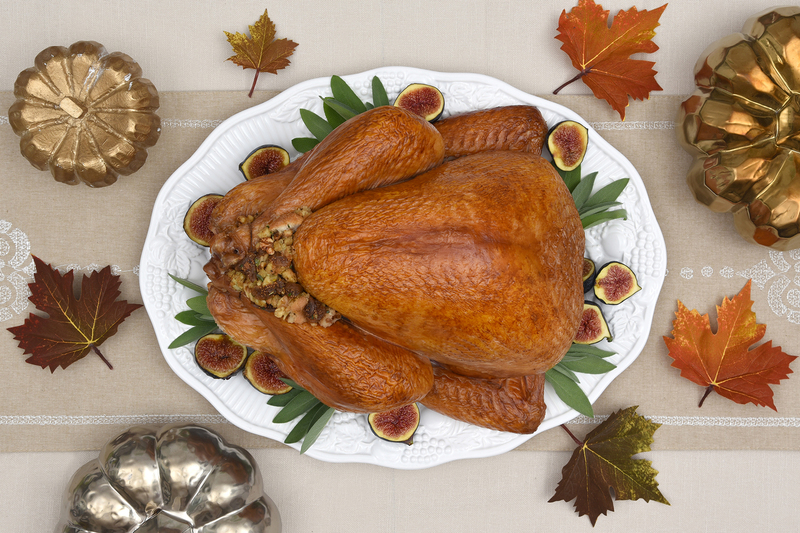 Here are 5 reasons you should be reaching for turkey during Canadian Turkey month. Turkey makes everyday meals delicious and tasty. It’s packed with deep and satisfying flavour and you can easily substitute turkey into any of your family’s favourite meals. 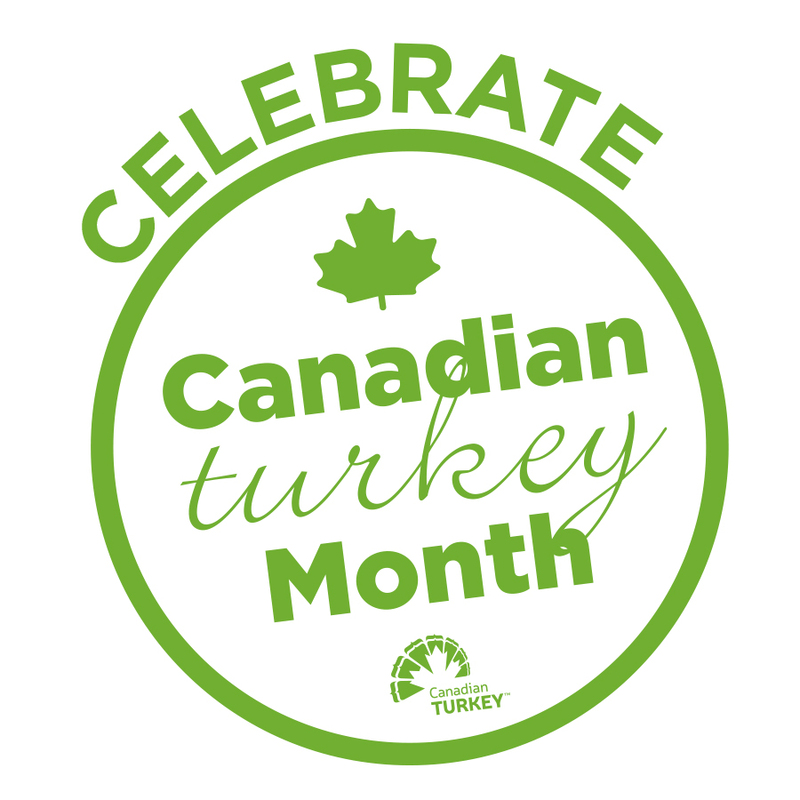 Make Canadian Turkey Month the time to sample some new and different recipes. It’s hard to believe but with turkey, both white and dark cuts are lean. That means you can enjoy any cut you prefer and feel good knowing you are choosing a healthy protein without compromising on flavour, tenderness or juiciness. To find out more about why turkey is a healthy choice for everyday living, visit https://www.canadianturkey.ca/nutrition/. Turkey is such a versatile protein, with so many cuts of both dark and white meat to choose from, including ground meat, legs, drumsticks, breast steaks, breast rolls, breast roasts, thighs, drummettes, wings, sausages, and burgers. With such a wide selection, you can enjoy turkey at breakfast, lunch or dinner, with leftovers that taste delicious the next day. Look for a variety of cuts at your local grocer or butcher during Canadian Turkey Month. Turkey plays well with other flavours. It’s hearty taste and texture marries well with bold profiles, making it a perfect partner for spices and rubs. Make recipes your own by using your family’s favourite flavours and change up your everyday dishes using rubs, marinades and sauces. Turkeys are generally larger than other poultry options and deliver a lot of meat for the price. Whole birds can be roasted for pennies per pound, and are a perfect choice for batch cooking meals or freezing leftover meat that can come in handy as an everyday meal starter. Cuts like drums, breasts and thighs are super-sized, so you need fewer pieces to feed your family and plan for leftovers to stock your fridge. 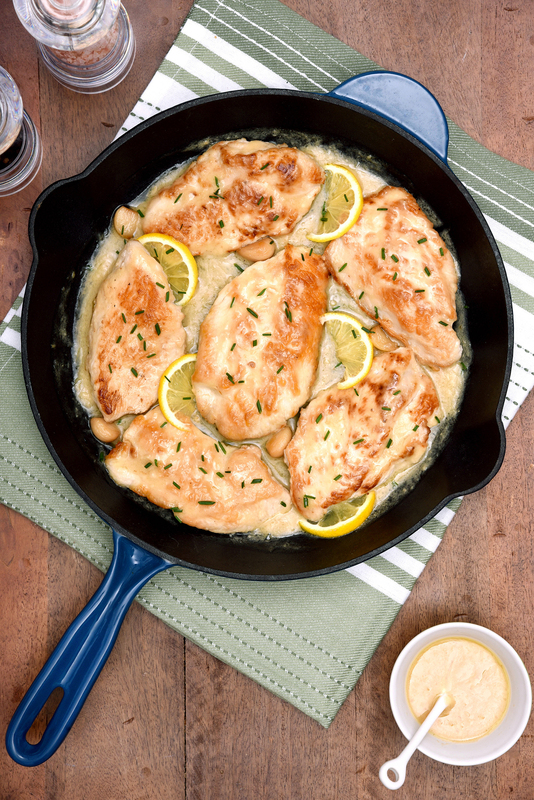 Have a healthy, flavour packed meal on the table in a snap with this Creamy Lemon Garlic Skillet Turkey recipe! Turkey is a great choice for a weeknight meal. 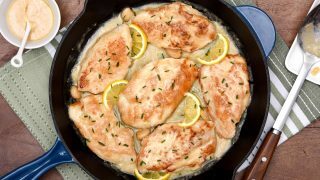 Pencil this Creamy Lemon Garlic Skillet Turkey recipe into your next meal plan and wow your family! Place the garlic into a small saucepan and cover with oil. Cook over low heat until the oil is barely simmering and the garlic is lightly browned and fork tender, 8-10 minutes. Do not overcook or the garlic will taste bitter. While the garlic is cooking, prepare the turkey. Slice into 1-inch pieces. Pound between 2 sheets of plastic wrap until thin, about ½ inch. Lightly dredge in flour, shaking off any excess. Heat 1 tbsp. olive oil in a cast iron skillet. Cook the turkey over high heat, 3-4 minutes per side until cooked through. Cooking time will vary according to thickness of the meat. While the turkey is cooking, discard all but 2 tbsp. of the garlic-oil mixture. Mash garlic with a fork until it forms a thick paste. (You can also use a mini-blender). Add lemon juice, any pan juices, a pinch of salt and mix to incorporate. If the mixture is too thick, add some warm water until you have a sauce of your desired consistency. When the turkey is cooked, remove from heat. 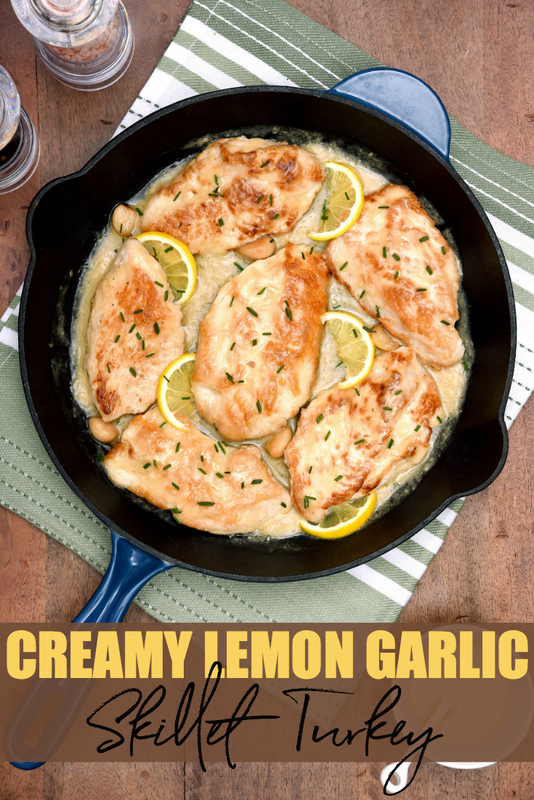 Pour garlic lemon sauce over the turkey, garnish with fresh herbs and serve immediately. TIP: Note that poaching the garlic in oil creates a mellow, sweet flavour. Leftovers from this recipe make delicious sandwiches for lunch or a quick meal on the go. Use hashtag #TurkeyTime on social media to share your turkey inspired meals, and get inspiration from others! This giveaway will close on October 12, 2018, at 11:59 PM EST. One winner will be drawn from all eligible entries and contacted via email on October 15, 2018. The winner will have 24 hours to respond to the email and claim their prize. If they fail to do so a new winner will be drawn. Please note that ALL entries are verified and if you submit an entry without completing it you will be ineligible to win. I learned that you can BBQ a turkey! I learned that flattening a turkey is called “SPATCHCOCKING” and that it has many advantages such as cooking faster and more evenly. Insert meat thermometer in the thickest part of the inner thigh, but not touching the bone. Delicious turkey always a great option anytime. Love it as a torta mmm with some avocado slices, sour cream and hot sauce. Just picked up an instant pot and learned today I can make a whole turkey in it! Saving me time and money!! I learned that when roasting a whole turkey you should let it stand for 20 minutes to let the juices set rather than cutting and serving it right away. I learned that you can keep turkey in the freezer for up to a year. I learned that turkey is cooked when the meat thermometer reads 170°F for an unstuffed turkey, or 180°F for a stuffed turkey . I learned that if you are planning to deep fry a whole turkey, to NEVER stuff it, and to ensure it is free of any moisture both inside & out! I learned that you should never thaw your turkey at room temperature. Never knew that. I learned when you cook a turkey on the BBQ. that after 20 – 30 minutes to tent turkey with foil to prevent over-browning. I learned that you should allow 5 hours of refrigerator thawing time per pound. I never knew you could deep fry a turkey..not something I would ever do!! I learned that when deep frying a whole turkey make sure it is totally thawed before immersing it in the oil. I learned you should never stuff a turkey that you are deep frying. I learned that thawing in water takes 2 hours per kg. I learned the safest way to thaw a whole frozen turkey is either in the refrigerator or in cold water. I didn’t know it was one hour of thawing time per pound! I learned the proper way to stuff a turkey! i learned not to thaw on the counter! yikes! I learned to stuff the turkey using a spoon so you don’t overstuff! I learned you should thoroughly rinsed a turkey after brining. The tip I did not know: Spoon stuffing lightly into turkey instead of packing firmly because stuffing expands while cooking. It’s important to thaw a turkey properly to prevent bacteria growth. The safest way to thaw a whole frozen turkey is either in the refrigerator or in cold water. 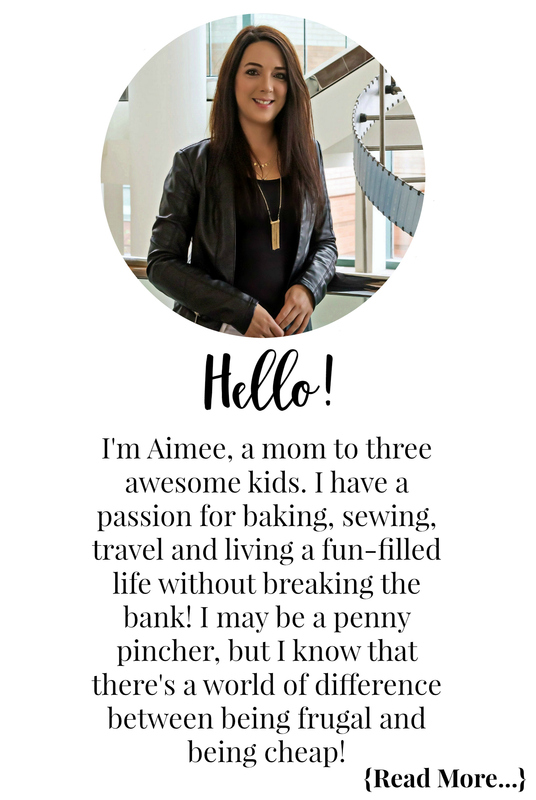 Thanks for all of the great advice on the blog – Just in time for Thanksgiving! I learned that an unstuffed turkey of weight 8 – 10 lbs or 3.5 – 4.5 kg should be barbequeued for about 1 ¼ – 2 hours. I learned that the refrigerator method of thawing a turkey is the safest. Always defrost the bird in the fridge or in cold water never at room temp. I learnt you should keep your fridge at 40 degrees F when thawing our your turkey and you should allow 5 hours of thawing time per pound (10 hours/kg). Deep fried turkey has always intrigued me! I learned to deep fry a turkey, the bird should weigh less than 15lbs. Do not stuff the turkey & deep fry outdoors in a special fryer or canning pot. Great tips on how to brine a whole turkey. You can keep turkey in the freezer for up to a year…Good to know for those on sale birds! A prep tip I learned is to let the roasted turkey stand for about 20 minutes (to allow the juices to set) before cutting/serving. I had no idea there was a 6-24 hour soaking period, and ideally should be done the day before roasting.. I never brinned mine that long! I learned about the cold water method and the fridge method for de-thawing ! Good to know ! I learned that you need to allow 5 hours of thawing per pound of turkey. I learned that after roasting your turkey you should allow 20 minutes resting time for the juices to reabsorb. I would like to try spatchcocking a turkey. We have flattened chicken before, but not turkey. I learned that the brining process for a whole turkey requires a 6-24 hour soaking period, and ideally should be done the day before roasting. I learned when thawing to Place turkey on a tray on a bottom shelf in refrigerator. I learnt several things Including the proper way to carve the turkey, Brining tips and most importantly Safe defrosting – that it takes 1 hour of thawing time per pound. All needed info. I learned not to rinse or wash your turkey, which is something i was always told to do. It makes sense not to, but it’s always what we’ve done. I learned that if you want to deep fry a turkey you need to use one that is less than 15 lbs. I learned that it’s good to let the turkey rest before carving!!!! I learned when thawing in cold water it takes 1 hour of thawing time per pound.